NEW YORK – Foreign Minister Tzipi Livni met with the Emir of Qatar Sheikh Hamad bin Khalifa Al-Thani Tuesday, in the highest-ranking meeting between Qatari and Israeli officials. The two met during a United Nations General Assembly summit in New York after the emir invited Livni and the Israeli delegation to join him in an unscheduled meeting outside of the UN headquarters. Officials said the meeting was "extremely positive." Livni discussed with the emir the importance of moderate Islamic nations – like Qatar – supporting the Palestinians in advancing the diplomatic process. Diplomatic sources said the meeting had important public relations significance. In the period leading up to the US-hosted Middle East peace conference scheduled for November, Israel is making widespread efforts at diplomacy with the moderate Arab nations of the Persian Gulf. Both the US and Israel are trying to influence the moderate nations to openly support a Palestinian-Israeli agreement and to back up PA President Mahmoud Abbas' moderate government – instead of Hamas – in diplomatic negotiations. 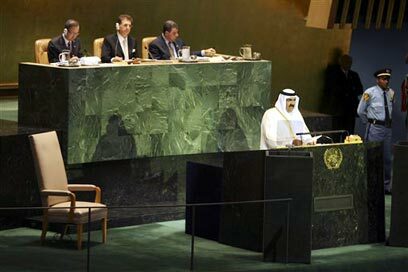 Throughout the UN assembly, the Israeli government received warm and sympathetic treatment from the Persian Gulf countries. In the past, the emir met with Shimon Peres prior to his presidential appointment. At the time, Peres presented ideas for cooperative economic projects in the Middle East, as well as his plan to establish an economic "peace corridor" from Eilat and Aqaba to the Yarmouk River to service Jordan, Israel and the Palestinians. During the meeting with Peres, Al-Thani expressed his willingness to have open relations with Israel, and even invited the Israeli diplomatic to visit Qatar in the future. See all talkbacks "Livni has surprise meeting with Qatari emir"